The majority of Travel Suppliers are now paperless and when you receive your booking confirmation and receipt, you should not expect to receive hard copy tickets. Where tickets are required, these are generally issued by the supplier 7-10 days prior to departure and NOT at the time of booking. Many bookings are made several months prior to departure and it is not practical to issue documents early which may be subject to later amendment. Flights: All you need is your flight booking reference. You can then go online (usually 24 hours prior to departure) to select seats and print your boarding passes. ** With the exception of Ryanair who make a charge for printing your boarding passes. N.B. Jetline does not pre-book your fight seats unless requested to do so. 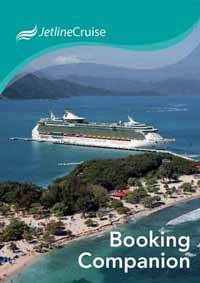 Cruises: Most cruise lines require that you log on to their system and complete a "Cruise Personaliser". You will be able to view your itinerary, access other information, book shore excursions, etc. If your cruise line does send tickets, these will be 7-10 days prior to departure as described above. Other docs: Train tickets, hotel vouchers, transfer vouchers, etc. These are generally sent to you as email attachments. WHAT SHOULD I KNOW ABOUT AMTRAK TRAIN JOURNEYS? (This applies only if you have an AMTRAK journey as part of your travel. It does not relate to other rail travel, e.g. Rocky Mountaineer). Amtrak operate a maximum baggage policy, and this can be reviewed at www.amtrak.com/baggage-policy. You will need to carry your passport when travelling on Amtrak. Trains should operate as per your confirmation, but unforeseen circumstances could affect your journey. We recommend that you contact Amtrak on 0800 872 7245 (US number) 24 hours prior to travel to reconfirm your departure time. If you have more than one leg to your journey, failure to check in for the first leg will result in the whole journey being cancelled. If you are travelling from Niagara Falls, Canada, to New York you will stop at the border to clear immigration (see VISAS above) which could take approx. 2 hours. This is included in the journey time and will not affect your arrival time. However, it can take longer if there is an unusually high volume of passengers to process. WHAT ARE HOTEL RESORT CHARGES? Resort fees and City Tourist Taxes are now charged by hotels in some parts of the world. These charges are determined by the hotel or city council and are subject to change. They cannot be prepaid and are beyond the control of Jetline Cruise. WHAT ARE MY BAGGAGE ALLOWANCES? Airlines: Each airline has its own baggage allowances for both hold and carry-on luggage. We advise that you check on your flight carrier’s website which will give you their permitted weights and dimensions. Should you exceed these allowances it will be your responsibility to cover any excess baggage charges incurred. If you have internal fights booked with a different airline, these may differ from your international flight allowances. Please make sure that you take this into consideration. N.B. US airlines no longer include any checked baggage allowance for internal domestic flights. Please check your carrier’s website for charges payable at check-in. Cruise Lines and Trains: It is important to check that all of your carrier’s baggage allowances have been taken into consideration. For example, Amtrak have a maximum baggage policy (see above).